I did these concept sketches for a client so his designer had something to work from. They didn't need to be detailed, just give an idea of where everything lies. It's the first time I've ever been scared to draw something because complicated city scenes aren't my specialty. But there is no trial like trial by fire and getting paid to learn is my favorite way to learn. After struggling with delicately crafted buildings and shapes that looked like something kids do* when drawing cityscapes, I decided it was time to be bold and started working in Photoshop with a thick brush. I focused on creating appealing silhouettes while still being mindful of perspective. I lowered the horizon to give the impression of being on the ground and looking up and then let my imagination go wild in creating the various signs and buildings because the focus wasn't any one particular building or sign but the idea of a city of signs. I thought in appealing divisions of black and white space as opposed to trying to conceive of individual buildings. 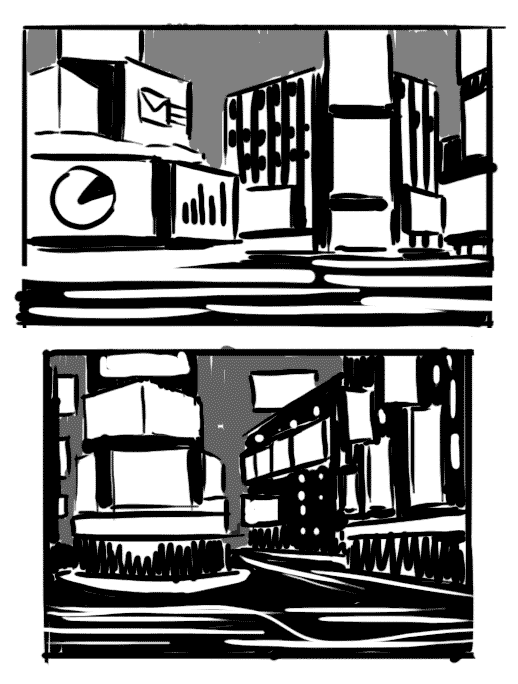 I no longer fear drawing cityscapes. *I actually like that drawing, but it's an example of what wouldn't work for this assignment.